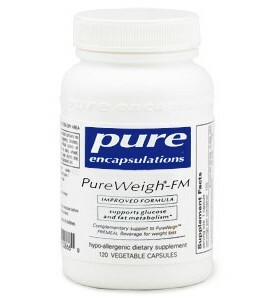 *PureWeigh-FM is an encapsulated supplement companion to PureWeigh PREMEAL Beverage for synergistic support of lipid and glucose metabolism during active weight management. Banaba leaf (Lagerstroemia speciosa L.) contains a triterpenoid compound called corosolic acid and has been reported in studies to support healthy glucose metabolism. A recent phase II, double-blind, placebo-controlled multi- center trial in Japan suggested that banaba extract maintained healthy glucose metabolism and was well tolerated by volunteers. Furthermore, an independent U.S. clinical study reported healthy weight management in human volunteers supplementing with a 1% corosolic acid banaba extract. Animal studies have suggested that corosolic acid may promote healthy weight management in part by moderating adipocyte cell differentiation. The green tea extract used in PureWeigh-FM contains a minimum of 23% epigallocatechin gallate (EGCg), which, in addition to its antioxidant power, has been shown in recent studies to enhance thermogenesis and fat oxidation. Combined with exercise, 7-KETO DHEA helps increase thermogenesis and basal metabolism to support healthy lean muscle mass. Taurine promotes healthy glucose, lipid and triglyceride metabolism. Taurine also stimulates the formation of taurocholate, which increases cholesterol secretion in bile and improves fat metabolism in the liver. Additionally, taurine is a powerful antioxidant, acting to reduce free radical generation in the liver, heart, pancreas and other tissues. Chromium polynicotinate (ChromeMate) supports glucose metabolism and enzyme activation. Biotin, a water-soluble B vitamin, facilitates protein, fat and carbohydrate metabolism by acting as a coenzyme for numerous metabolic reactions. Magnesium citrate is a highly bioavailable form of magnesium and is an important mineral involved in nearly all physiological processes, including glucose metabolism. 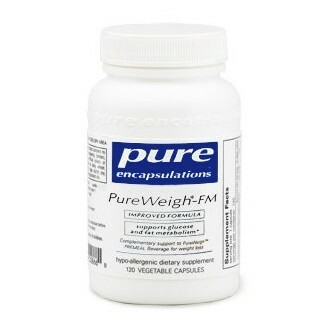 PureWeigh-FM is designed to provide enhanced support for glucose and lipid metabolism as part of the PureWeigh PREMEAL Beverage weight management plan.